Help protect meats, vegetables, fruits, baked goods and more from harmful freezer burn with these slider freezer bags. Quart-size bags are made from extra-thick material and feature the extra-secure MaxLock track design so they're easy to open and close with a simple sliding motion. Seal design securely clicks closed so you know your food will stay fresh. 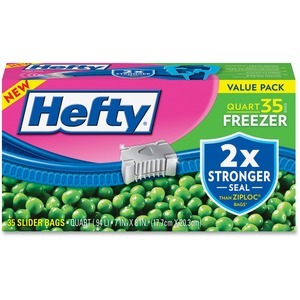 Plus, these freezer bags boast a large, write-on label for easy identification of your food.